Third and final day in merry old England. Our entire focus today was the changing of the guard. We had just one thing to do. We had to be there no later than 11 am. We were up and out in plenty of time, even with confirming our flights and checking in online. Creatures of habit already, we left the hotel, turned right and headed the few blocks to Starbucks. It seems I’ve developed quite an affinity for the real ceramic mugs, shunning the “take away” cups. The problem with the mugs is they’re not particularly portable and once committed it seems only polite to linger over said cuppa. Realizing the time we chugged the last few sips of our americanos and headed through the park. We would be there with thirty minutes to spare. And about 3,000 people would be there before us with 31 minutes to spare. We had a fantastic view of the backs of many heads. We persevered with partial shots of unsmiling fuzzy capped bloaks, a few mounted guards and more photos than we should have of a particularly roguish bobby. 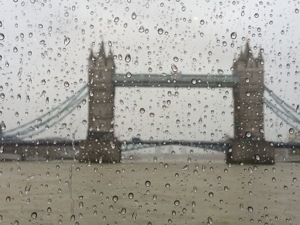 It would have to turn around at the tower bridge because high winds would prevent it from docking at Greenwich pier. Foiled again. One short round trip later we disembarked into the pouring rain. After a few flips of the umbrella we did the only thing we could do. We ducked into a pub. Karin chose England’s national dish of fish and chips while I opted for potato wedges. Always potatoes. I’m beginning to think I may have an unhealthy relationship to my beloved spud. But I digress. It was here in this pub that the tiny old theatre would make its encore appearance. While paying for lunch, Karin realized she no longer had her credit card. The only place she had used it was the theatre. We now knew what we would be doing for the rest of the afternoon. I’ll spare you the details of having to try to find this theater again. Suffice it to say it involved many walking miles, several phone calls, more than one google search, a cup of coffee and two bookstores. But the card was there and so order was restored. A brief layover before dinner at Barnes and Noble’s English cousin, Waterstone, would be a nice rest and provide a little diversion before heading back. Tired and hungry we asked our new best friend, the concierge, for a quiet and close dinner recommendation. He suggested a little pub around the corner. We were to go left and then left again. It had never occurred to us to go left. When we did we found this magical little place with tiny European style cafés with 5-8 tables each, boutiques that were already closed for the evening and bricked streets. This was a Londoner’s London. It was the perfect way to end our day and our three day romp through the busy streets and sites of this lovely, welcoming town. Tomorrow will come early. 4:30 to catch the car that will lead us to the next leg of our adventure: Chennai, India.